Thursday January 13th 1921 We were down in Kentucky when I got up. There was snow later in the day. I find pleasant people in the car. It rained on us all afternoon. Our train is late. Friday January 14th 1921 It was still raining this forenoon. We reached Jacksonville 4 hours late, at twelve oclock. I was with a Mr & Mrs Moore. I found very pleasant. I left at 3.45 and reached Sebastian at 11.15. It was still raining. A man and his wife from Cincinnati, Ohio, were the only ones beside myself. We found a comfortable little hotel to spend the rest of the night. Saturday January 15th 1921 Ida came over from Fellsmers in an Auto and we got here on a little train. I wrote the folks from Sebastian. Aunty soon had dinner ready. Later and I walked down town. This is a quiet beautiful place. My trunk came tonight. Sunday January 16th 1921 Ida went to church and I looked over the papers here from home. I read a book in afternoon and evening. a couple of ladies called in afternoon. Ida and I walked to P.O. 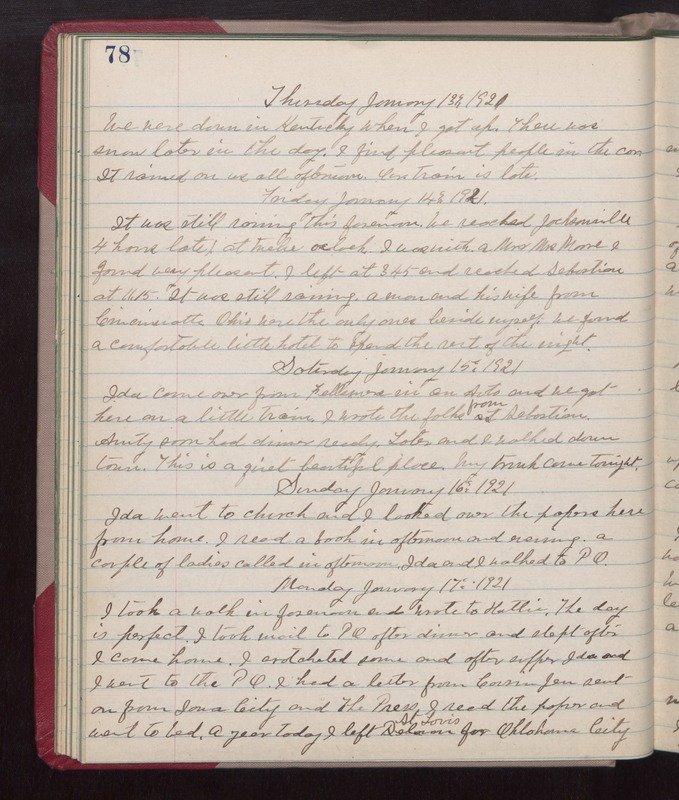 Monday January 17th 1921 I took a walk in forenoon and wrote to Hattie. The day is perfect. I took mail to P.O. after dinner and slept after I came home. I crotcheted some and after supper Ida and I went to the P O. I had a letter from Cousin Jen sent on from Iowa City and The Press. I read the paper and went to bed. A year today I left St Louis for Oklahoma City.